A Mexican priest, Father Miguel Angel Machorro, was stabbed in the neck while he was saying mass in Mexico City’s cathedral on Monday evening. Witnesses say it looked like the attacker’s intention was to slit his throat but was unsuccessful, fortunately. Father Machorro remains in critical condition, a spokesman for the Archdiocese of Mexico said. The attacker, who was caught as he was trying to run away, identified himself as a U.S. national. Mexican authorities identified him as 35 year old, John René Rock Schild. The man said he is an artist but refused to offer any incriminating information, Mexico City prosecutors said. At a news conference, a lawyer of the archdiocese, Armando Martínez, said they needed more information to draw any conclusions. “We cannot talk about terrorism, we cannot talk about motives because we obviously have no significant facts,” he said. The stabbing took place in front of dozens of worshipers at the Mexico City cathedral. In a radio interview Tuesday morning, archdiocese spokesman Hugo Valdelomar provided some details of the attack. 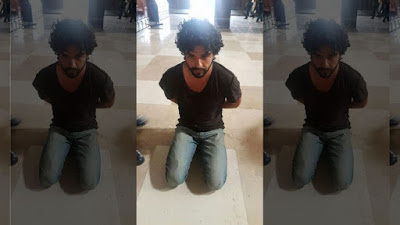 "After celebrating mass at the high altar, Father Miguel came down [to the pews] to bless worshipers with holy water and when he turned to walk back to the altar, the man stops him and tries to slit his throat,” he said. “He grabbed his neck and tried to slit his throat." Valdemar said that Father Miguel sustained serious wounds near the jugular vein and the lung and was bleeding profusely. “We almost lost him right there,” he said. The spokesman said that the attacker showed extreme coldness and declared he was not a Muslim nor did he belong to any Islamic group He noted that when the man was arrested he reserved his right to testify — "that means that he is not so crazy either, shall we say," Valdelomar said.